SOCIB is offering access to its glider fleet based in the Balearic Islands as described in the guideline document for competitive access available below. This is a unique opportunity for scientists and engineers to use high-quality autonomous underwater infrastructures operating in coastal, shelf and open sea areas for carrying out research, monitoring and/or testing activities. SOCIB’s Glider Facility offers External Users Access to ocean gliders, global leading edge platforms for international research and technology development, to complement its routine and strategic programme of glider endurance lines in the Mediterranean (up to 196 days in 2014). Since 2013, the available time for External Users Access is 90 days per year (96 effectively in 2013 due to a glider battery problem in the 1st deployment). For process-oriented studies (for example complementing a dedicated R/V cruise), a minimum of 7 days usage is required. Longer monitoring proposals of typically 30 days or more are encouraged. Proposals have to be drawn up in line with the Proposal Template. Note: The TNA activity (in the frame of JERICO-NEXT EU project) aims to provide coordinated ‘free of charge’ trans-national access to researchers or research teams from academy and industry to SOCIB Glider Infrastructure among others. Detailed info. at http://www.jerico-ri.eu/tna/. 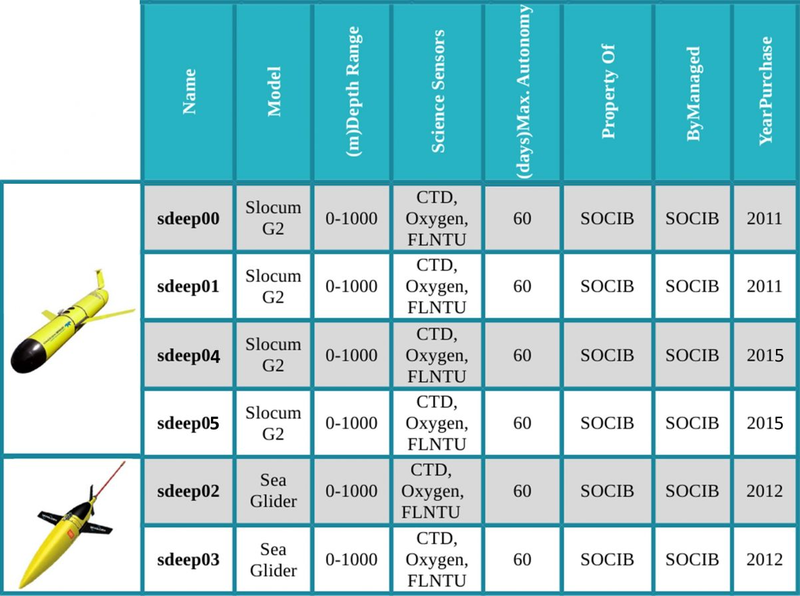 The present SOCIB glider fleet consists of 4 Slocum gliders and 2 iRobot Seagliders. More than 30 glider missions have been performed, collecting ~25000 hydrographic and biogeochemical profiles. Request for additional information and proposal should be sent to , with [external access 2018] in the subject of the mail.